The Story of a Nice Mormon Girl: Fitting in When You’re a Single Square Peg in a Round Hole Made for Two. Fitting in When You’re a Single Square Peg in a Round Hole Made for Two. Reprinted from Meridian Magazine January 2011. It isn't easy to sit down every other week and come up with something to say to thousands of invisible other singles. Are you out there? Can you hear me? Sometimes it is hard to know if anyone is listening or cares. And yet, I sit down and do my best week after week. In my estimation, I have written over 100 articles for Meridian over the past eight years. Of which approximately 99 were about singles, dating, and single life. Of those 99, 98 were written specifically to the singles. But two weeks ago, for the first time ever, I wrote to everyone else. To the Not Singles. I said some very blunt, straight-forward, and direct things, trying as hard as I could to remain emotionless and polite about it. The responses did not surprise me one bit. The sheer number of responses did surprise me, but not what was in them. Out of 105 responses (as of the night I wrote this column), just about 80% of the people made it clear they thought I was whining, and that I should be telling the singles how to better integrate themselves, rather than offering advice for how other people could better involve the singles. 97 columns written for the singles. How sad is it that the majority of people have never bothered to read the 97 columns obviously written for singles. We all know why they haven't done it- they aren't single. It didn't apply to them. Why should they bother? And yet the majority of these people think that singles need to buck up and involve themselves more in activities and lessons not geared towards them. So today we return to our regularly scheduled programming, and speak directly to the singles. How can we better involve ourselves? 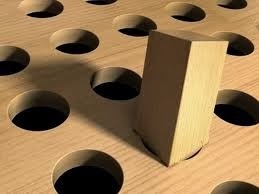 How can we fit in and find happiness as a square peg in a round hole? May I first make this suggestion? (As silly as it sounds.) Be grateful for the hole. Be glad you have something you care about so much that you want to fit in. Be grateful for the Gospel, the ability to attend Sunday services, and that you have the freedom to attend. Third, you don't have to fit in or belong. Sometimes it just isn't going to work. You can try and try, but if the other party doesn't want to accept you, it just isn't going to happen. Find an online forum, or friends in another ward or stake to be friends with. You ward is nothing but geography. There is nothing that says you have to have something in common other than geography. Fifth, I recently sat through a very well-planned and thought out third hour lesson, taught by the Stake Presidency. The topic? Better communication in our families/relationships. I would venture that 90% of the lesson was about strengthening marriages through better communication. I could not agree more. Unfortunately, I live alone, and my dog does not appreciate my attempts at better communication. Throughout the entire lesson I kept thinking to myself, “I should go see if I can swap with someone in the nursery or Primary. Give someone else the chance to go sit with her husband.” I didn't do it, but I should have. By the end of the lesson I was really kicking myself for not doing it. Singles, make yourself useful when things get irrelevant. Go relieve someone else, go help in the kitchen, do something. You don't have to just sit there and doodle. Sixth, do it yourself. If your stake or ward is seriously lacking in decent singles activities, plan something on your own. Seventh, don't get left out because nobody knows you exist. Go up to the head of the quorum, or the class president, and introduce yourself. If there is one thing I have learned, it is that no one will take an interest in that lonely, bored looking person in the back of the room. You have to let them know you exist. Eighth, enjoy yourself. Don't have anyone to join for family home evening? Here's my favorite thing to do! Monday nights tend to be pretty dead in most restaurants. I take a good book and go try a new restaurant. Because they tend to be slow nights, I can sit and read and relax by myself. Take your scriptures, and you'll be surprised how many conversations strike up with other patrons! Ninth, pick a family to be your new family. Sit with them, bring their kids treats, say hi in the halls, etc. You don't have to tell them you made them your new family. Just start being nice to them, and wait to see what happens. A few years back I picked a family to be my new ward family and did this. Within two months, their little four year old boy was running down the hall to me, dragging me to sit with him. I often had to hide my tears, so he wouldn't see me crying, I was so touched and happy to be loved. A few years prior to that I was in a different ward. There was a couple with many children, but only one still at home. The father frequently traveled for business and wasn't there. We had a crowded ward, and when there was just enough room for me to join them on their bench each week. Before long it became natural and expected that I would sit with them. The father and I began comparing Blackberry models. The mother began saving me a seat in Relief Society. Their son? I'll just be impressed if he ever learned my name. Just having someone who expected me to sit with them made me go from feeling like one, long, single person in a ward of 500+, to suddenly belonging. And it was because I chose to sit with them, and not because someone came to me. Tenth, last but not least. Don't give up. Never surrender. Nothing lasts forever. Leadership changes, people come and go, and life marches on. What seems like a miserable circumstance today, will disappear completely in a week. And when it gets to be too much? Just send me an email and we can commiserate. I'm here for you. That's all the time we have today, ladies and gentlemen. Thank you for all your comments and insights last week. It was truly overwhelming to get such a response. Next week we'll return to our more light-hearted and fun fare. Maybe even talk about the ridiculousness that can be online dating. Or not. I'm not so sure the more genteel married folk are ready to hear the honest (and perverted) truth about online dating yet! We shall see. Until then, singles, good luck and keep up the good work. If you are reading this, than you are doing something right. It means you care about the Gospel, and being true to the Church. Good for you. Now help us all out, and leave your personal tips for getting involved in your ward below! Musical artists - if you want a different approach to Pet names for girls the seafood, annihilation bests allotment these people after acclaimed pleasant artists. Artists include the apotheosis associated with greatness. Hi Erin, how about a link to the piece that elicited all the comments? Yeah, I want to see the piece, but I'm too lazy to find it. We as Latter Day Saints need to spend more time out of our comfort zone. Sit next down to that single soul sitting in Church. Have them sit with the family, have them over for dinner, and singles need to spend more time with married people. We shouldn't categorize ourselves as married and single...we should categorize ourselves as brothers and sisters.